Merry Christmas and my the force by with you! In preparation for the holidays I printed some Star Wars Storm-trooper Snowflake ornaments. You can find the model I used for this project here. Storm Trooper Snowflake Ornaments in the office. 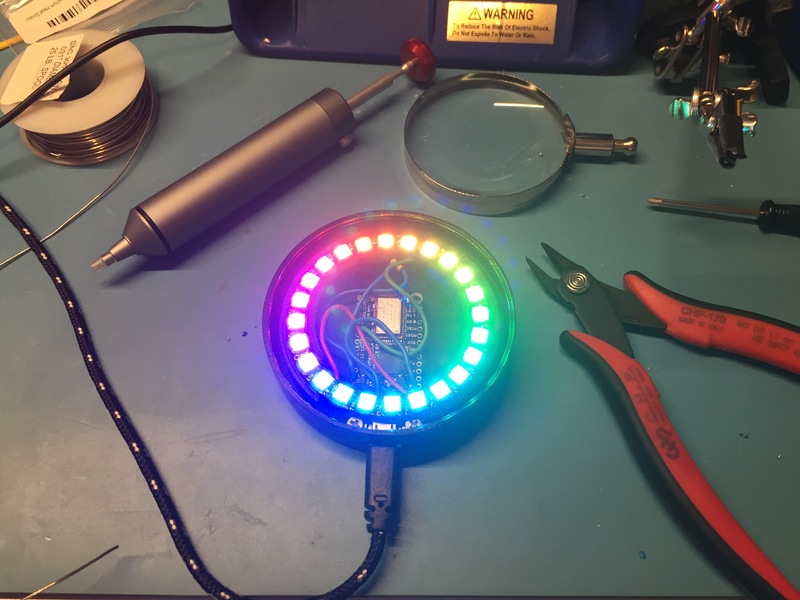 Happy Holidays and I look forward to even more maker projects in the new year. I’ve wanted to try using wood filament for quite a while, but the price for it was generally more than I was willing to pay for it. 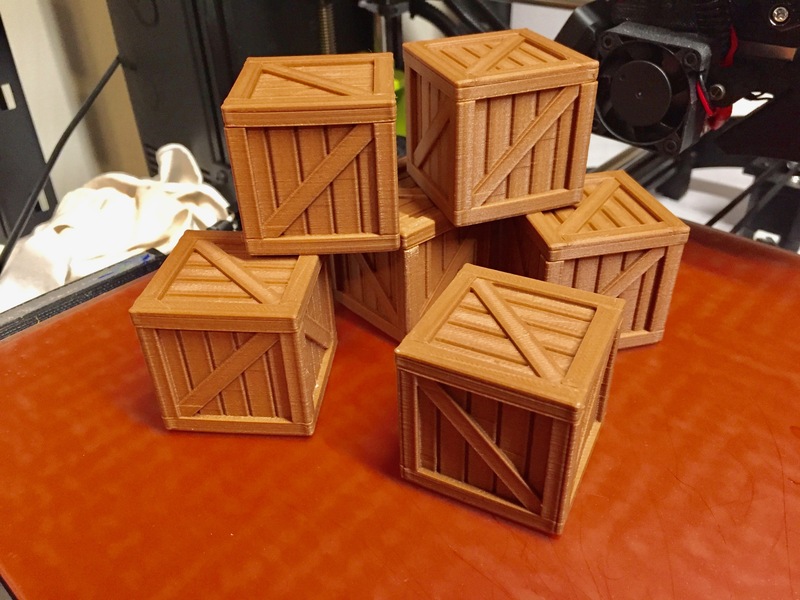 Wood Crates — Printed in PLA with wood fiber in it. My friend Adam told me about a company calls SainSmart on Amazon that has good quality filaments at a reasonable price. I ordered a few colors of PLA including a roll of their Dark Wood 3mm PLA filament which you can find here. The filament worked out great and has a nice woody look. It even makes a bit of a wood/sawdust smell as it prints. (Probably terrible for your lungs so make sure to work in a well ventilated area with any 3D printer). 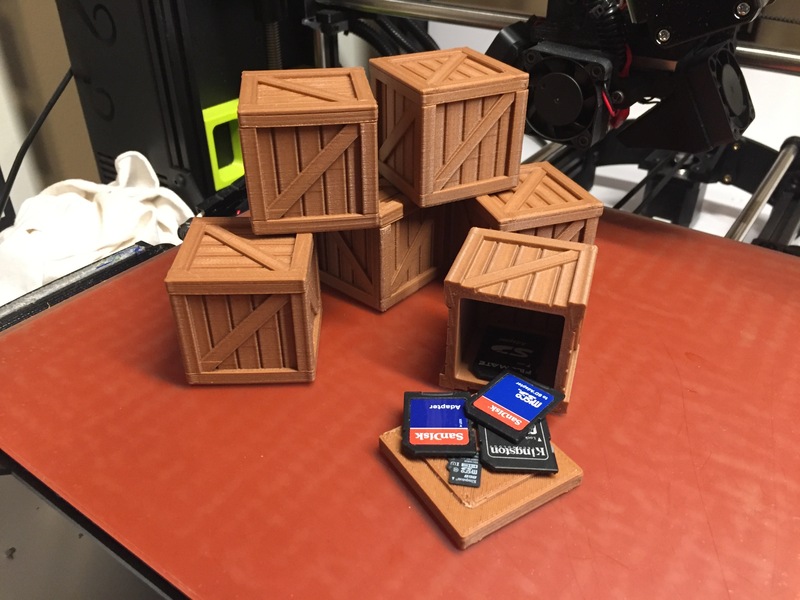 These crates work great for background props and SD card storage. They print well with no supports at all, but had a very tiny bit of warping at the corners. By printing a brim I felt the warping was sufficiently negated. I used Gorilla brand CA glue to adhere that little square to the underside of the lid (keeps the lid from sliding off the top of the crate). I figure these crates will make nice background props when photographing other toys or prints and for the more practical minded maker they also work well as a nice SD card holder that can accommodate full size SD cards. They stand nicely inside the crate with the lid in place. 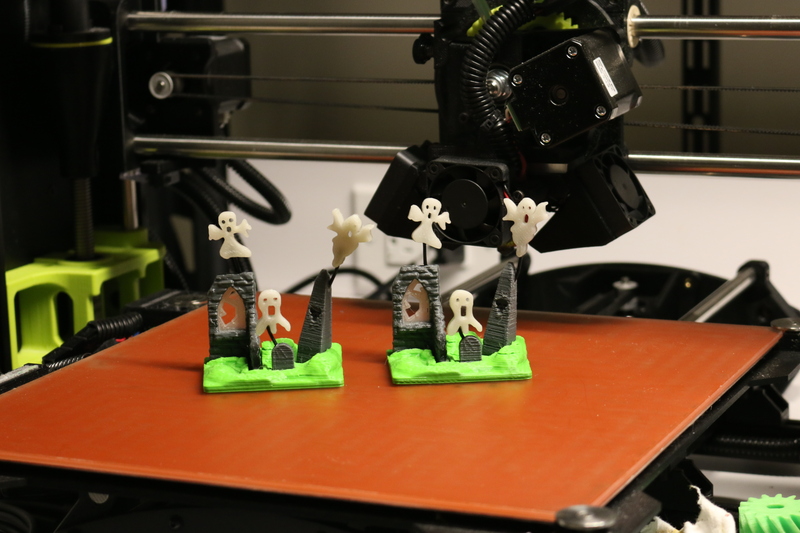 With Halloween fast approaching I figured it was time to add some 3D printed decorations to the office. Below are some of my pics for fun Halloween themed prints. I tried to pick some models that demonstrate varied printing techniques. 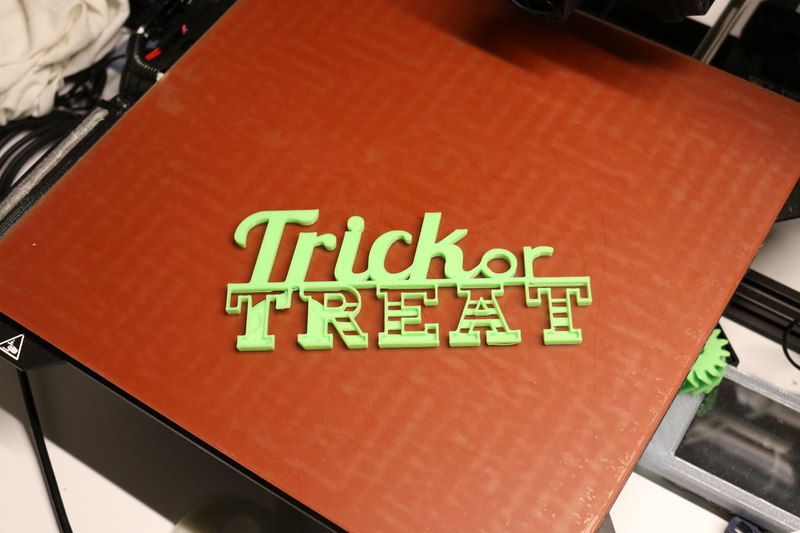 This model is a quick print and can easily be adhered to a smooth surface with some double sided tape. Printed in ‘Glow in the Dark’ Green PLA from eSun you can find the model for it on Thingiverse here. Printed in lime green PLA from MatterHackers at 125% to have better/cleaner details compared to the same details on the original model listing which can be found on Thingiverse here. This fun little diorama took a little more work to create but was interesting to put together. The green terrain was printed in green nGen filament. The gravestones are dark gray nGen. 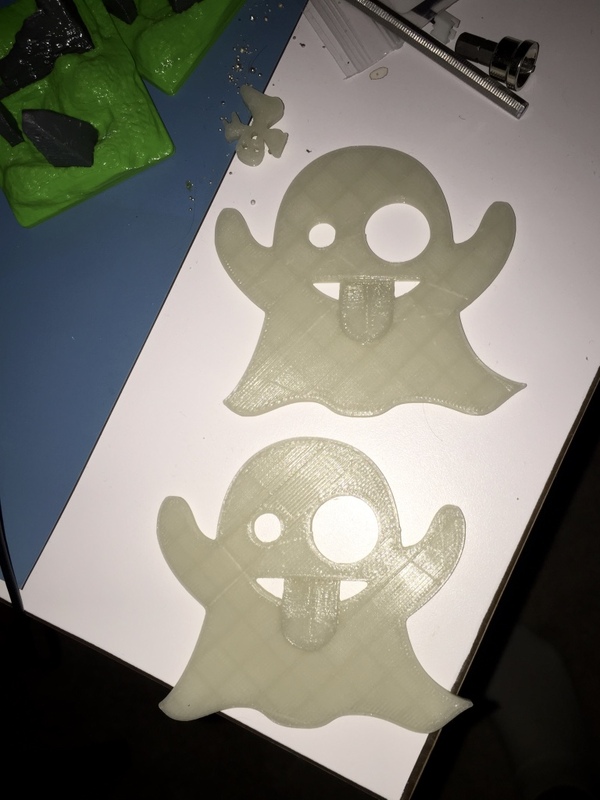 The ghosts and glass are ‘Glow in the Dark’ Green PLA. 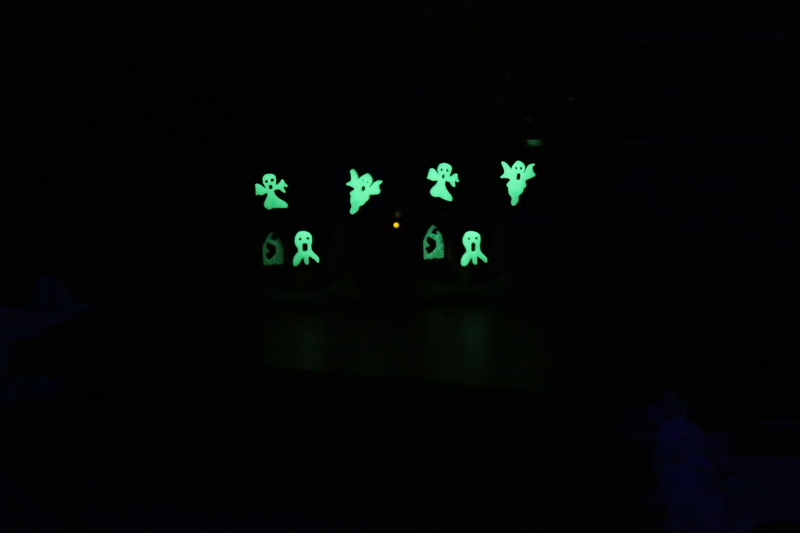 Glow in the dark graveyard scene. One for my office and one for my wife’s office. 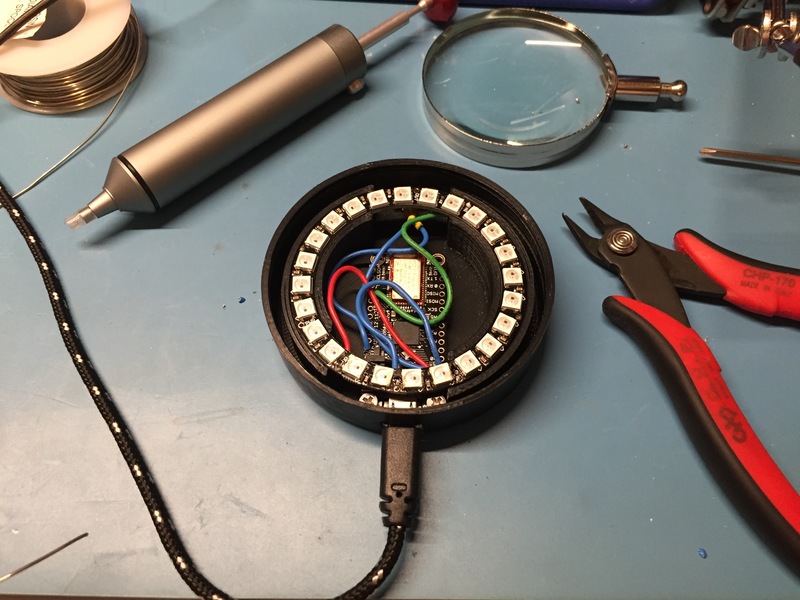 I used some short lengths of 22 gauge solid core wire with black insulation to affix the ghosts and give some ability to change their angles etc via bending. I also used CA glue to attach the stones to the base and to lock the wire into the holes in the stones and the holes in the ghosts. 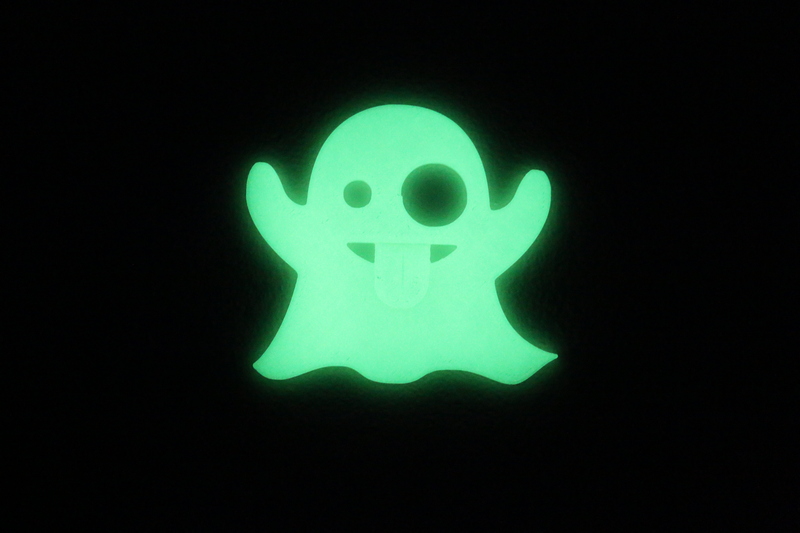 Ghosts glowing brightly after being charged up by a handheld black light. You can download the model for this 3D scene from Thingiverse here. This print was a great way to experiment with 2 color prints. I set Cura to pause at a given height, swapped the red nGen filament out for some white nGen filament and resumed the print. Now I have one logo for the old movies and one for the new release. You can find this model on Thingiverse here. 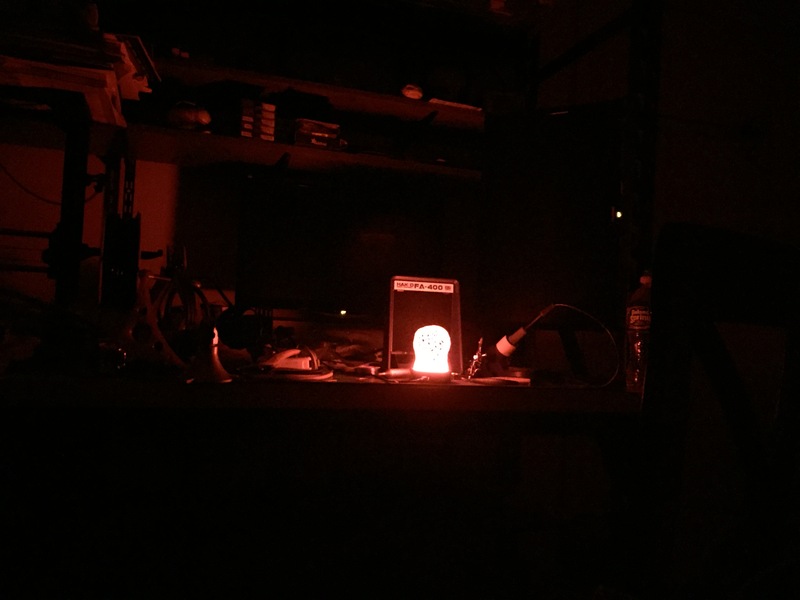 I printed a remix of the Makies Jack-O-Lantern that allowed me to have a different color peduncle and snap off lid. The body of the pumpkin was printed in nGen orange and the peduncle is in nGen green. 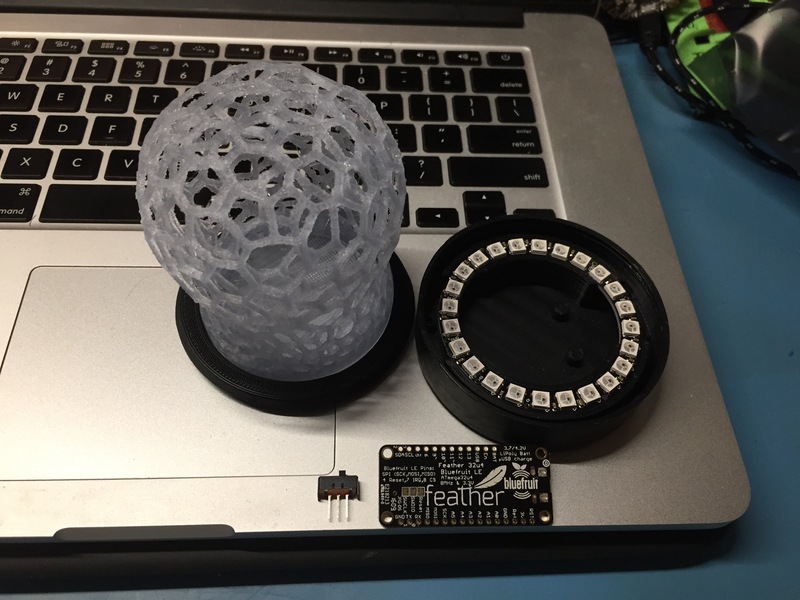 You can find the model for this project on Thingiverse here. 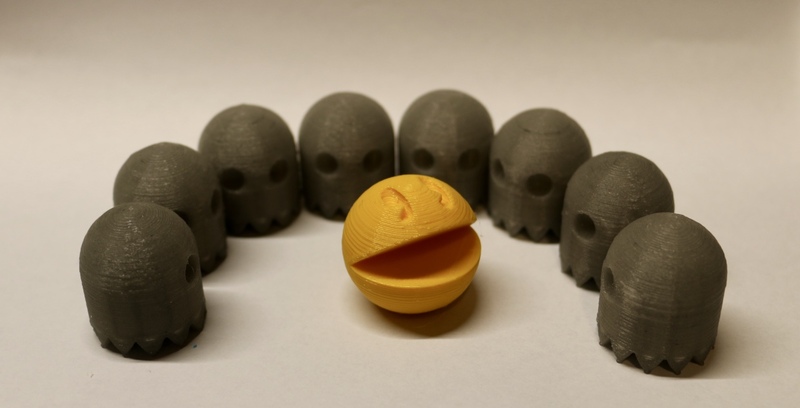 If you print any of the above models make sure to post them on Thingiverse and/or in the comments section below. 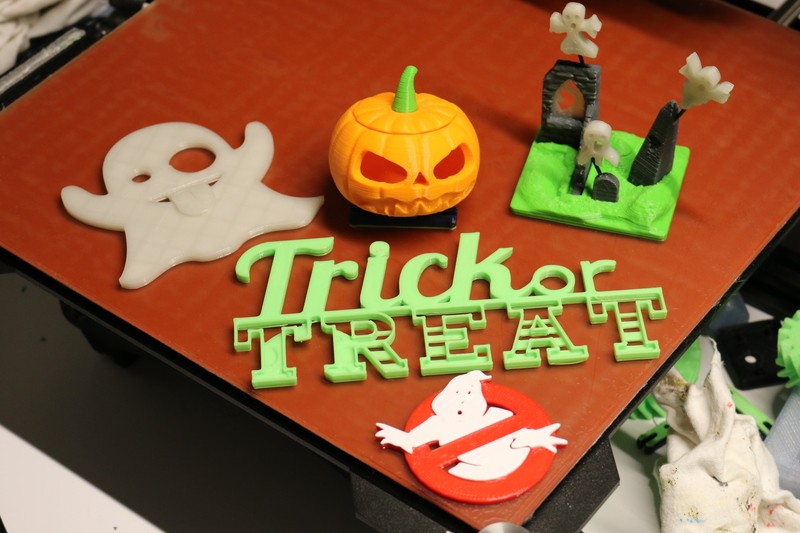 Also let us know if you have some other Halloween themed models that would be fun to print and experiment with. Wow, thats a lot of little maker faire robots. Why are they running away? Yeah, lots of nGen color samples. I use this model as a sample print to have a record of each color I have. Apparently I’ve been building a robot army. Some models really do seem to get stuck in your head or on your printer bed. These tiny Maker Faire Robots are models I use to print samples of various filament colors. Like so many other models lately it was not good enough to make one for my maker bench, I needed to make one each of the robot with his arms up and one with his arms down. But that still wasn’t enough, I also wanted a set for the office at work. 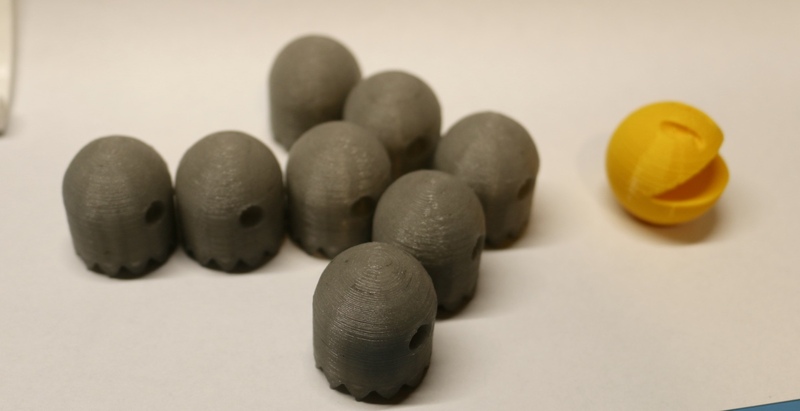 I wound up printing 4 robots, two of each style each time I got a new spool of nGen filament. 32 robots later and 1 of the larger articulated versions I thought it was time to take some photos of the brigade. I recently picked up a dedicated macro lens and had some fun playing with depth of focus in the above shots. Removing a print from the bed of your 3D printer can sometimes be a harrowing experience. You wait for hours for the print to complete, maybe even dealing with a few failed attempts and then go on to break or mangle your print trying to get it off the printer bed. My Lulzbot TAZ6 came with a nice little kit of tools but the print removal tool was basically a clam knife with a thick handle like a steak knife. I tried using that tool to remove my first print and it made the only gash I have in my PEI print bed. I then went on to buy a dedicated print removal spatula for about $8 on amazon. It was incrementally better — looks like a long frosting knife and was a little bit flexible, but was still thicker than I wanted and took some work to get a print off the bed. After looking at that tool I thought about some real nice palette knives I have in my woodworking tool kit that are flexible and machined down to the point that they are almost sharp. I dashed out to the shop and grabbed one — the shape I least liked and least used for my woodworking was by far the best I’ve ever used for 3D print removals. (See photo above) That sharp corner and VERY thin edge is great for getting up under a print and quickly removing it. Since I switched to using this tool with my printer I have not lost a single print due to issues getting if off of the bed. The knife tapers down to 0.008″ (twice the thickness of a human hair) at its thinnest and is about 1/16″ near the tang. This profile with a point off to one side (far right in photo below), along with the ability to easily flex the knife allows the user to easily pop printed items off of the bed. All I do is get the corner under the print and make a quick sweeping motion and the print comes right off the plate. If you’d like to get a set of these useful palette knives you can find them at Lee Valley here. The set only costs $11.50 USD and should last a very long time. I also use them a lot for applying wood glue to my woodworking projects. If you give them a try or have your own tips for consistently getting a print off the printer bed, please leave a note in the comments section below. I grew up during the first wave of Ghostbusters movies and loved the franchise ever since. I had all the toys as a kid. Back then it was a lot harder to make your own custom toys. My first few weeks with my own 3D printer has been the usual stage of ‘print everything I can’ — trying to get as many things off of my long Thingiverse ‘Like’ list as I can. The week the new Ghostbusters movie came out in July, I printed out a version of the new Ecto-1 hood ornament in nGen silver metallic filament. It made a great hood ornament for the truck as we went to go see the movie at the drive-in. Hood ornament makes a nice addition to the truck. 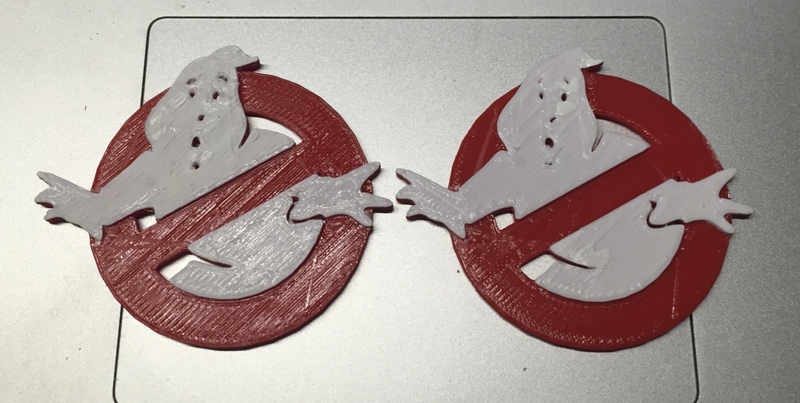 This week with some red and white filament in hand I printed out the classic Ghostbusters logo — one for my maker workbench at home and one for my office at work. It’s not bad enough to print 1 of everything, lately I seem to be printing lots of stuff in duplicate. Some models on Thingiverse can become addicting to print. 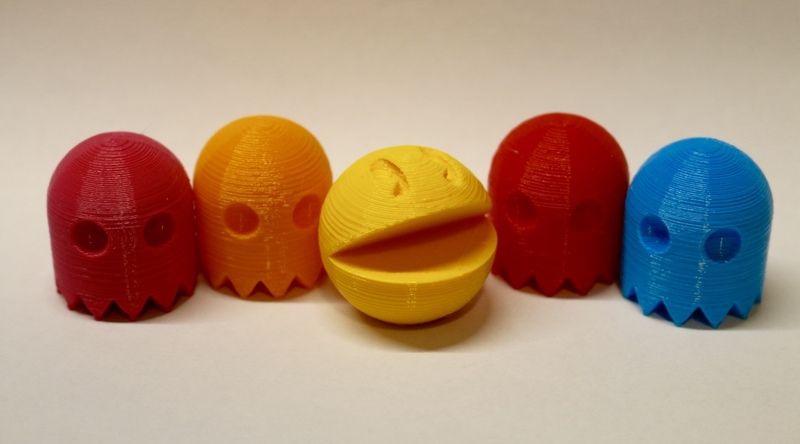 I found the PacMan ghosts to be that sort of model. 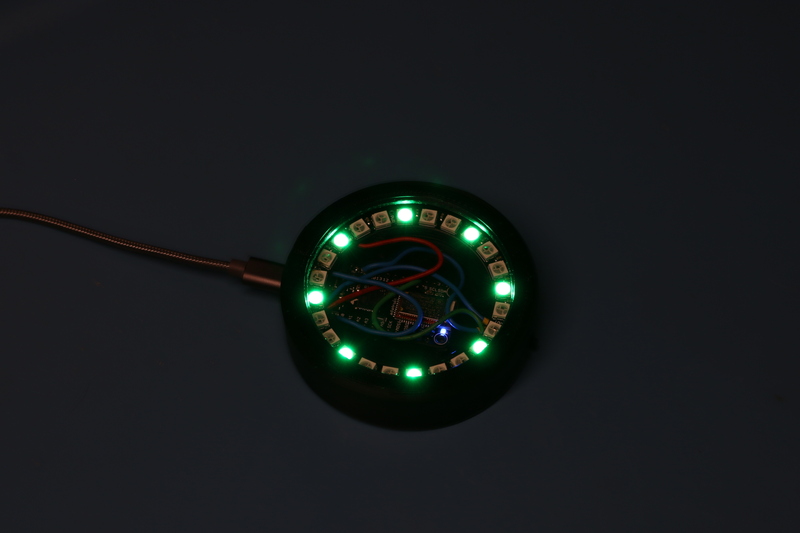 I made one…..
And 4 into 8 etc etc. The bright colors make a nice addition to the desk and are fun to setup in different configurations. I also made a set for my friend Ken who has his own video game museum. 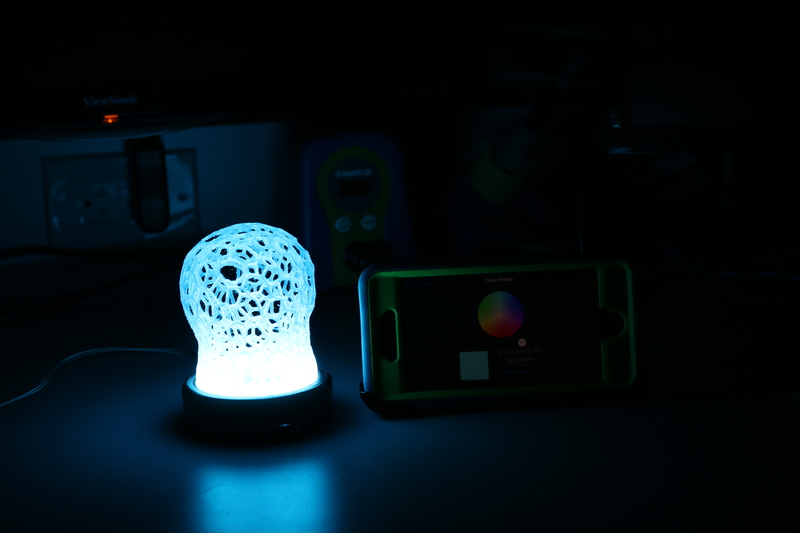 The colorful prints are all made from nGen filament. 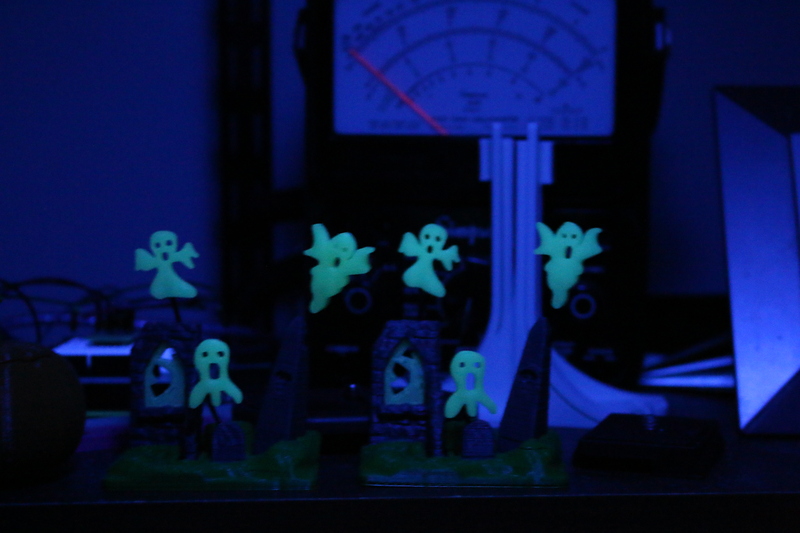 The gray looking ghosts are printed in Village Plastics glow in the dark blue. 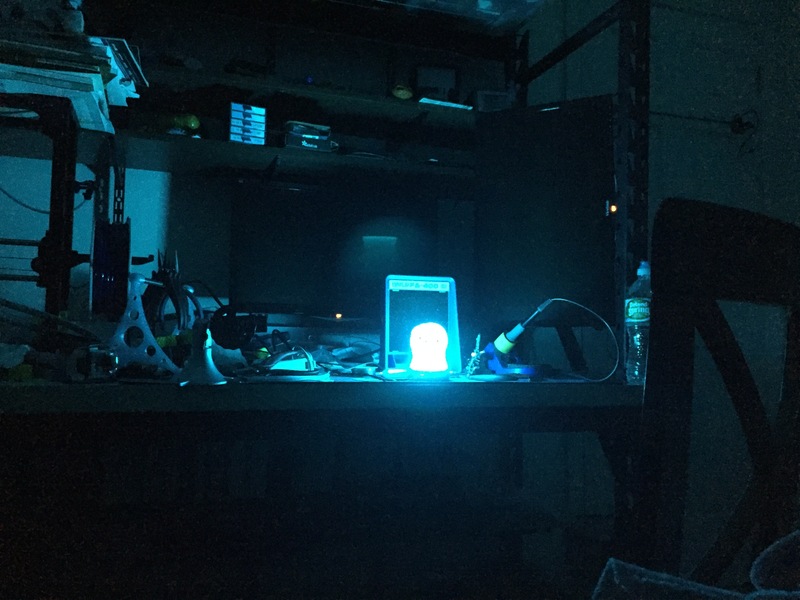 The glow works well when they are charged up, but the LED lights I have don’t seem to throw out the right amount of light. I had to put them in a sunny spot or under a traditional incandescent bulb. Got some new filament today and beyond my normal favorite test print of the herringbone gear bearing I printed off a few Maker Faire Robots. It was a fun little print and I like how they look in nGen Yellow filament. Printed on a Lulzbot Taz 6, Standard Resolution, 20% infill. The robot with his arms down came with support material that was removed during the print cleanup. Maker Faire Robots — Yeah! 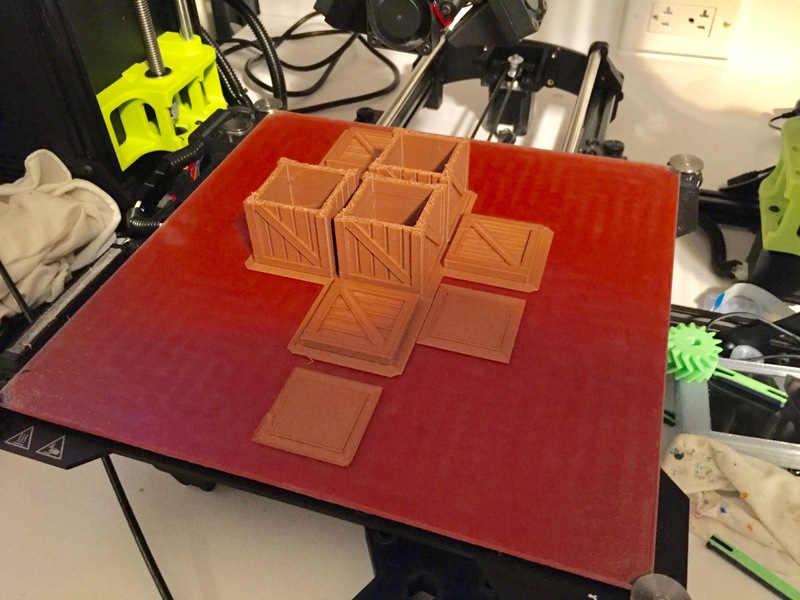 If you’d like to see more of the fun random things I print out (And yes others are more interesting than the ubiquitous model below I promise) please check out my Thingiverse profile here.